What can be done with used chopsticks? I got a bowl at a craft fair once that was strung together with fishing line and folded up. That was pretty cool. I have made a folding business card holder with them. I was wondering what else people have thought of. They are great for when it's time to plant seeds. Use them to put your hole that you plant your seeds in. Not a how-to site but this site sells many different items made from chopsticks that are facinating. If you tape about a dozen or so together they make great drum sticks. You only tape the bottom portion (basically the same width as your grip) and the stick tips and bodies make a great clicking sound as you strike them against an object. 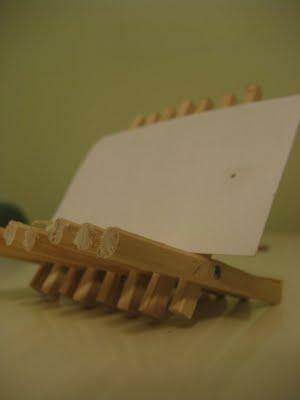 You should also apply some glue at the base before applying the tape which keeps the center sticks from falling out. You can even find crafts using the chopstick paper wrappers, too. Enjoy! Wow cool ideas and quick. That bowl in the first link is the one I have. It's pretty good. 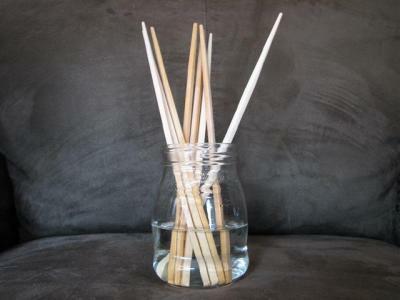 Thanks for posting the photo of the reed diffuser. I think you are right that something that got thin would be better. Maybe a tiny erlenmeyer flask. Chop sticks also make great little tools to saute vegetables.